Radiant is pioneer in using Bundle Pullers for insertion and extraction of heat exchanger bundles in India. Use of these machine not only enhances safety but also saves time. The Aerial Tube Bundle Extractor is suitable for use on all shell and Tube Heat Exchangers to pull/insert max up to 2.5 mtr. Diameter and bundle of 60T & 12 mtr length. The load is trimmed using an Aerial Balancing Cylinder which makes it easy to off load the bundles when the extractor is putdown on the ground. Radiant is pleased to induct in their fleet of Tube Bundle Extractors the state of the art Peinemann make Combi Lifter. This lifter can both be used as an integral part of the Aerial Bundle Extractor (Main Lifting Frame) as well as a separate Bundle Lifter when disconnected from the Aerial Bundle Extractor. 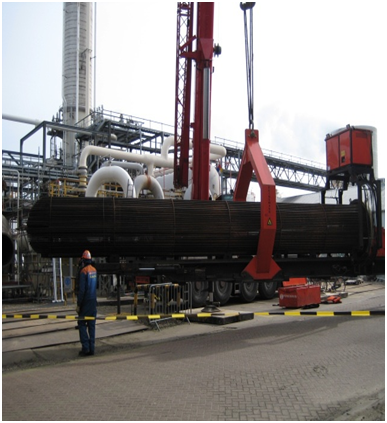 After pulling out a Heat Exchanger, the combi lifter is placed on the ground and the lifter can easily remove the Heat Exchanger without disconnecting the crane. The bundle can be easily lowered onto a trailer for transporting to the cleaning area. The operator can open or close the bundle lifter by means of 6 hydraulic cylinders in order to adjust the clamps according to the size of the tube bundle. The side clamps are adjusted to the size of the tube bundle, the operator can lift the bundle lifter by means of a crane. 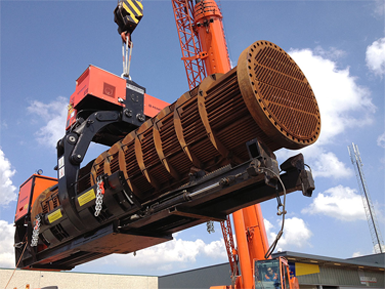 The machine can lift the tube bundles from the extractors, trailers, rollers or from the ground. As the bundle lifter holds several baffle plates on the bundle, damage to the tubes or tie rods is down to a minimum, making this a very safe, efficient and time saving tool.